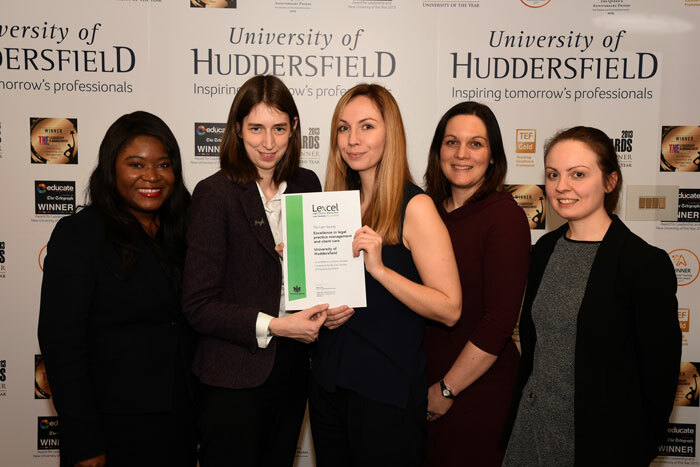 In January 2019, the in-house legal team at Huddersfield University was awarded the Law Society’s Lexcel accreditation. As an academic institution with strong links to Switalskis – several of our lawyers are Huddersfield University alumni and have previously volunteered with the university’s Legal Advice Clinic – we are delighted to report on their in-house team’s success in achieving this accreditation. Lexcel is the Law Society’s quality mark for law firms and provides customers assurance that the team meets the high professional standards expected of solicitors. Highly coveted by in-house teams, the accreditation has been handed down to very few other teams within universities. Switalskis’ lawyer and Huddersfield University alumna Amy Clowrey, presented the team with their award on Wednesday 30 January at the university campus. Amy is an award-winning solicitor in the Child Abuse Claims department and is currently sitting as the Chair of the Junior Lawyers Division of the Law Society of England and Wales. Amy Clowrey presents the Huddersfield University in-house team with their Lexcel certificate.